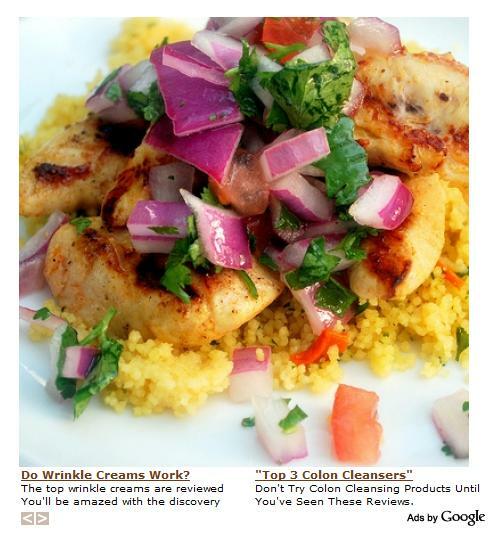 Tequila Lime Chicken with Couscous Colon Cleanser? I was looking over my Twitter feed today when I saw a post from one of my favorite Tweeters, @foodphotoblog. The tweet was simple: “Tequila Lime Marinated Chicken Over Cous Cous” followed by a shortened link to the blog post, which features a tasty looking picture of said dish. That’s right, wrinkle creams and colon cleansers. Now I’m guessing there are some digestive benefits from eating cous cous, but this was probably not the reason it showed up. It definitely made me think twice about how appetizing the food looked (who am I kidding, it still looks delicious!). As expected, when I clicked on the ad it took me to a site selling colon cleansing pills instead of a page about the health benefits of couscous or, better yet, tequila. But I’m not too worried, I’m sure Google will figure out this Internet thing sooner or later. Anyway, the chicken is a Rachel Ray 30 minutes or less recipe, which Sweetnicks adapted and served over couscous. Check out the Tequila Lime Chicken recipe and remember to keep your colon clean! I’ve actually cooked the tequila lime chicken dish, and agree that couscous would be a great addition. As for those added “benefits” of the dish… well I’m not too sure.